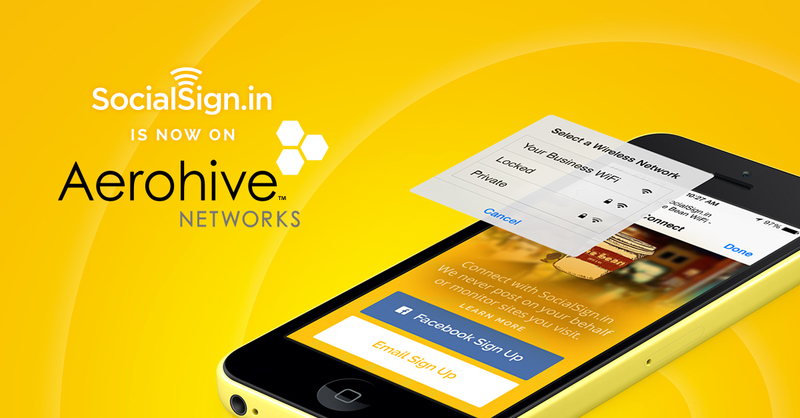 SocialSign.in is excited to announce that we are now fully compatible with Aerohive hardware and access points. Our technology is designed to work with Aerohive’s cloud-based infrastructure, which means that any business or venue currently using Aerohive hardware to provide WiFi can deploy SocialSign.in quickly and easily. From start to finish, setting up SocialSign.in in your business will take less than 15 minutes. What other benefits exist for Aerohive hardware owners who start using SocialSign.in WiFi marketing? Lightweight Authentication: Any Aerohive equipped business can customize the messaging served to their WiFi users based on device type, profile settings or engagement history. This yields conversion rates as high as 55% for our existing customers. Activate Once, Access Anywhere: Your customers using free guest WiFi only need to activate their device once to become a part of our network, effortlessly connecting them to WiFi at all of our locations, including your business, for all future visits. Accomplish What Matters: We help your business onboard customers into its most important initiatives. From loyalty program enrollment and increased weekly app downloads to enriched CRM data and social engagement, we can do it. Network Offers: Businesses who join the SocialSign.in network can reward new and existing customers with access to unique discounts and offers based on their visitation frequency. If you use Aerohive hardware, we’d like to give you a free 90-day pilot of SocialSign.in to help you make the most of your WiFi investment. Click here to get started. Founded in 2007, Aerohive has quickly grown as an industry leader in enterprise network architecture and innovative mobile solutions. Since then they’ve amassed over 5,000 customers and have established themselves as a serious threat to Cisco and Aruba Networks, titans of the enterprise wireless networking industry. Our team respects the hustle and hardware that helped them get where they are today, and we’re excited to be part of their tomorrow. We've put together a quick, easy to understand "Beacons 101" guide.